I t’s the 27th of August and we’ve made it to a camp at 13,500 feet (4114 meters). 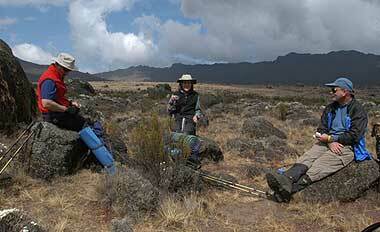 We are still on the west and the north side of Kibo still some distance from our goal. Tonight’s camp we are actually just at the base of what’s known as the Northern Icefields on Kilimanjaro. It’s a beautiful camp. I’m just outside the dining tent; I was just in there with Julie, Alex and Jim. They are having popcorn, cookies and tea as an afternoon snack. I stopped by the cook tent and Hodson and the rest of the team are working hard on tonight’s meal. They were making vegetable samosas which Hodson said was going to be the appetizer. I’m not sure what else he has in store for us tonight, but I know it will be another of his wonderful meals. I’m now taking some photographs because the Northern Icefields and this side of Kili are in brilliant light and that big full moon is starting to rise over Kilimanjaro right now, so it’s a beautiful view. 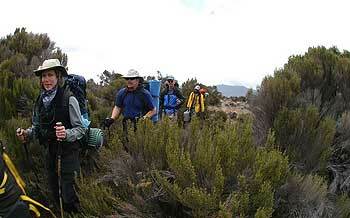 This is the wild side of the mountain, coming in here today we saw Eland trails. You know Eland is the largest antelope of Africa and we saw a lot of droppings that were relatively fresh and we also saw large dog droppings, Nicholas says they are wild dogs. The African Hunting Dog is the last of the wild animals that I haven’t seen in my years and years of wandering around the Serengeti, Ngorongoro and Tarangire. It is pretty fascinating for me to think that there may be still some African Hunting Dogs, roaming at night of course when we don’t see them on this wild side of Kilimanjaro. We are in a beautiful place, we’re becoming acclimatized more each day and we have the companionship of a wonderful staff. 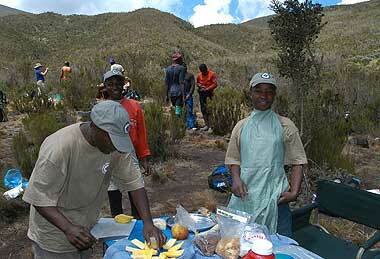 Things couldn’t be better for this group on Kilimanjaro. We’ll report to you tomorrow from our camp quite a lot higher on the mountain at the Lava Tower .